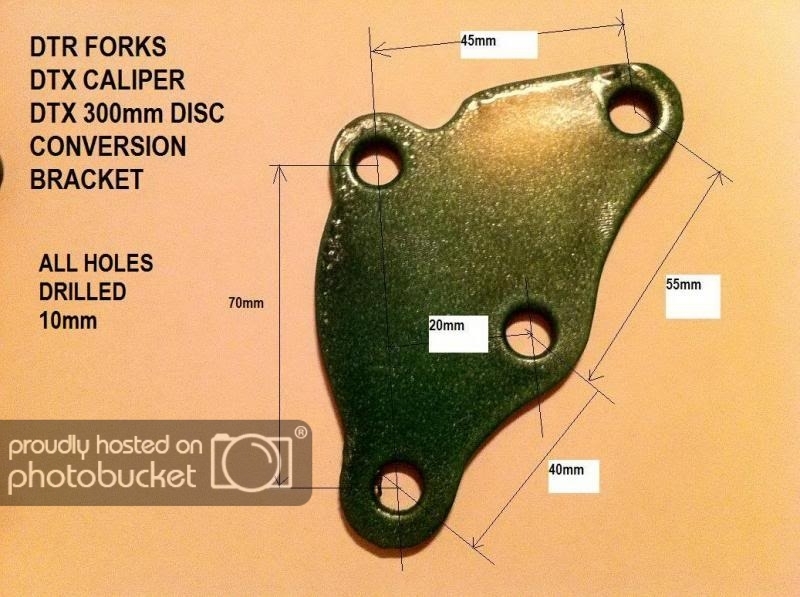 Hey guys, so i have dtx wheels and dtx brake for front (Brembo) but a DTR Fork and i have seen this picture with the caliper to fit it but the image only includes the measurements between the holes. Did anyone ever build this caliper and can send me exact measurements or even sells it? @conmador Nobody sells these or any brackets for the brake upgrade, so you will have to make one yourself or find a CNC cutting shop to make one for you. You may find it easier to get a set of DTX forks, or a set of USD forks from another bike and the full brake set-up so that you can run the larger discs etc. The USD's will require a bearing cup made up, but that would be less hassle than using this bracket and trying to match other parts. @conmador Those dimensions should be correct, it's a custom part you will have to make.